Kathleen Florence Brown, later Smith, (no. 10 on the 'British team call up list' of female skaters) was born in Highgate, London on 30th January 1944. As a teenager she used to frequent the Alexandra Palace roller rink with friends and used to enjoy the social atmosphere that existed at the rink in those days. Kathy particularly used to look forward to the speed sessions enjoying the thrill of going as fast as she could around the track. In the late 1950's and early 1960's the rink was also the training venue for some of the London based speed clubs, Alexandra Palace, Broadway and North London. Wanting to join a club Kathy decided on North London as the one for her. Their training days fitted in nicely with her own domestic schedules and very soon she found herself taking to the track as a fully fledged speed skater. In March 1964 Kathy won her first medal in a competition, a silver in the Anderton Cup on her home track at the Palace. Just ahead of her was a skater who would play a big part in Kathy's own racing career over the next 20 years, Chloe Ronaldson (Alexandra Palace). In November of the same year Kathy would win her first race, the Lyn Bern Trophy just ahead of Christine Dennis (Alexandra Palace). With races up and down the country, very often the clubs grouped together and met at Turnpike Lane to get the coach to whichever venue they were racing at next, whether that be up north in Leeds or down south at Herne Bay in Kent. The camaraderie that existed between clubs was evident for all to see. Although a serious sport and great rivalry on the track, many inter club friendships existed off it. It was one such friendship between Kathy and Alexandra Palace skater, George Smith, that soon blossomed into something more and in 1965 the couple were married. In 1966 Kathy took a sabbatical from the sport when she became pregnant with her first child, Lesley, although she did continue to skate right up until she was about six months pregnant! Lesley was born in June 1966 and Kathy took a step back from skating for a short while to embrace motherhood. It wasn't long, however, before she was back on her skates and training like mad once again, her busy schedule helped by George's shift work as a bus driver. 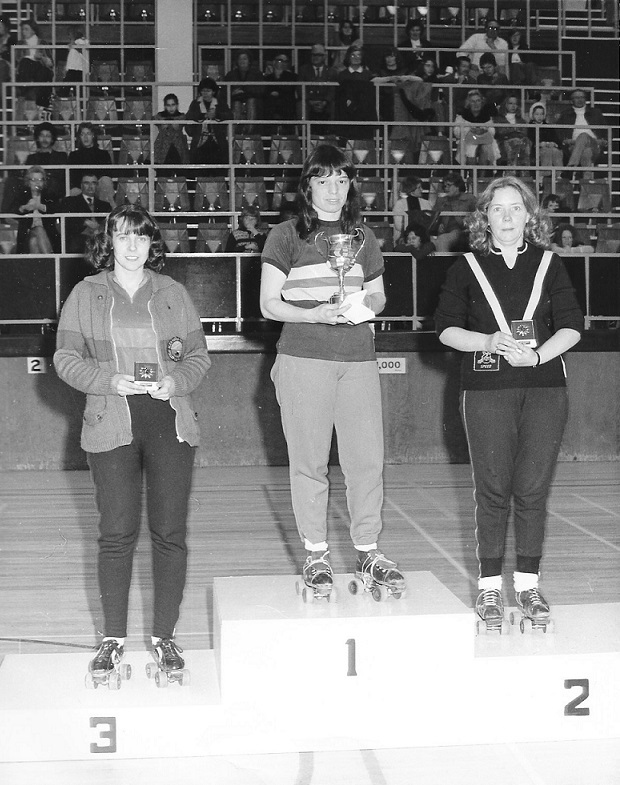 In January 1967 Kathy was once more back to winning ways when she took gold in the Southern Trophy one mile handicap, the first three skaters all being awarded the same time such was the closeness of the finish. It was the first of five times she would take home the gold medal in this event. By now it had been announced that Spain (Barcelona) would be the venue for the women only World Championships and Germany (Inzell) was to host the very first European Championship that was to be held separately from any World Championships. 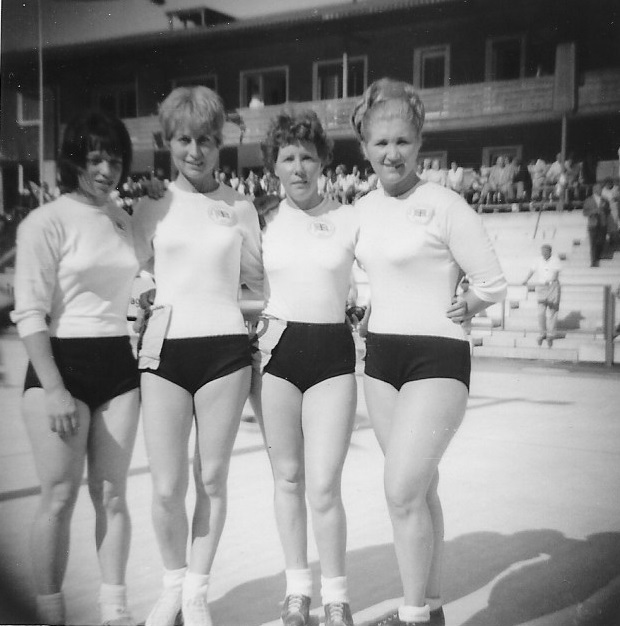 Whilst Kathy did not make the team for Barcelona, she was included on the team sheet for Inzell. She had so impressed the selectors that she was now a fully fledged member of the British team. There were only three events for women back then and Kathy would only get to skate in one of them, the 3000 metres, finishing a creditable 12th in her first outing in a British shirt. Motherhood would once again play a part in Kathy's skating career when she became pregnant for a second time, missing out on an opportunity to skate in the 1968 World Championships. Colin, her second child, was born shortly afterwards. For women skaters in general international competitions were a very sporadic affair. The 1969 World Championships in Argentina were for men only and there were no World or European Championships in 1970, but that didn't stop Kathy racing domestically and with some success. Kathy always looked upon the trio of Pat Barnett, Pat Eason and Chloe Ronaldson as the elite women in the sport. Each was a world medallist, Eason and Barnett had held world records and Ronaldson was by far and away the most successful domestic skater in terms of British Championships, both male or female and to break into that group was an achievement in itself. "I always felt a bit out of it with the others. They were used to the trips abroad and racing amongst the other countries whereas it was all new to me. Obviously I was part of the team but I felt a bit of an outsider. Geoff Mattock from Birmingham was also on the team that year. It was his very first time and believe it or not he was a great help to me during those championships." 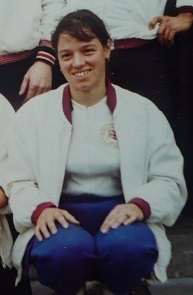 Regular team member Pat Eason did not make the team that year through injury, being replaced as it was by Peggy Davis, a North London team mate of Kathy's. Kathy would skate in three out of four events with a top ten finish in the 500 metres time trial. 1972 was another lean year for skating in general. There was no British, World or European Championships that year and very few domestic events. The mass closing down of the roller rinks meant that domestic skating had to move outdoors. It was a poor time for speed skating in Great Britain with races now being held on car parks, roads or even motor racing circuits, sometimes having to piggy back off other sporting events. In 1973 the European Championships were to be held in Grenoble, France. Kathy, like always, had been training hard and was working towards another British team selection, however, fortune once again was not on her side. During one of the team trials and eventual selection, Kathy's son, Colin, developed a severe case of measles. Putting her family first she was unable to attend the trials and as a result was not considered for selection despite having taken yet another bronze medal in the 500 metres British Championship earlier that year and second place in the relay. It was a testing time for Kathy but she knuckled down and made sure she was ready for Italy in 1974. As expected, Kathy once again made the British team for a third time in 1974. The European Championships were held in San Benedetto del Tronto, Italy but the regular British team manager, Bob Halford, was unavailable and as a result Dennis Cousins stepped in to take charge. It was not a popular choice amongst the skaters. Halford had been an international skater himself and had been looking after the national team as a manger now for a number of years. Under his leadership Britain had enjoyed a multitude of international successes at both World and European level. Cousins, it was felt, had not much to offer and tensions ran high as he continually tried to stamp his authority and keep the team on a "tight leash". The British team consisting of five men and five women, as well as a male and female reserve, was the biggest senior team sent to a major international competition either before or since. Despite this, Britain did not enjoy any success. It was the first time the British team did not bring home a medal of any colour from a European Championship. The closest to a medal was 4th place by John Mullane in the 500 metres time trial, although John E. Fry and Geoff Mattock would get bronze in the relay, but at a time when it was not considered a championship event. Kathy skated three of the four events, her own highest placing a modest 11th in the time trial. It was championships to forget, for everyone involved. 1975 saw the scheduling of the first World Championships since 1969. There were two in fact. The first was again an all male affair in Argentina on the track, but the second was a road championships at Sesto San Giovanni, Italy. Kathy was again unavailable for selection now pregnant with her third child, Dean. Once again a World Championships had eluded her. Despite winning British Championship medals in 1976 and 1977, it would be another four years before Kathy stepped on the track again for Great Britain. Throughout the latter part of 1977 and early 1978 the North London coach, John (Dai) Davis, had been working with an up and coming teenager, Lyn Coles. Lyn had just turned 16 and had been a successful junior winning both events in the first ever Junior Girls British Championships twelve months earlier. Now she was senior and Davis was hell bent on making her a star and one of if not the youngest senior women's British Champion and set about putting her on a training program to do just that. On 16th July at Southampton, a big, wide and sweeping 480 metre cycle track, the National Skating Association once again held their British Championships. The question on everyone's lips was could Coles beat the sprint legend, Ronaldson. Ronaldson had won this title every year it was held since 1965 and now she faced her biggest test for a number of years. Coles was 16, Ronaldson was 39. The last three skaters were Coles, Ronaldson and Kathy Smith in that order. Coles went off and posted a time of 56.60 seconds, the fastest time ever seen recorded by a British female skater domestically over this distance, and threw down the gauntlet to Ronaldson. Then Ronaldson went off and posted a time of 57.20 seconds, some six tenths slower than Coles. Euphoria ensued as everyone expected Coles to be crowned the new British Champion. Everyone except Kathy Smith that is. The last skater to go, Kathy came home in a time of 55.70 seconds, almost a full second faster than Coles. There was disbelief around the circuit, but Kathy had done it. She had beaten the up and coming star that was Lyn Coles into second place and sprint legend Chloe Ronaldson into third. It was undoubtedly the most satisfactory victory in Kathy's skating career and she could now call herself British Champion. Over the years there has been some suggestion that it had been a blustery day and just as Kathy took to the track the wind dropped and Kathy made hay whilst the sun shone. Personally I don't buy this. If it was such a windy day as some suggest then for a 500 metres event on a 480 metre circuit anybody sprinting into a headwind one way would get a huge shove in the back when facing the opposite way, negating any suggestion of an advantage, surely? Not only that, but the suggestion that everyone else had to endure blustery conditions but the wind subsided just for Kathy...and then for a whole minute, is possible, but somewhat implausible. The fact remains that Kathy Smith was always more than capable of winning the event on the day. She had trained for it and also had something to prove. Windy or not, she went out there, took on all comers, walked off the track a champion and wrote her name into the history books. Despite her victory she was once again faced with a situation where the NSA did not take any women to major championships that year. Then in 1979 it all changed again. Kathy could not repeat her British Championship winning performance of the previous year, although she did medal in every distance, including the relay and the Open Handicap Championship for the Vi Kirby Trophy. Now aged 35, these performances once again secured her a place on the British team for the 1979 European Championships to be held in Ostende, Belgium. Kathy skated four of the five events but it was the relay where she found success. Together with Lyn Coles, Chloe Ronaldson and another rising young star, Denize Lipyeat, Kathy brought home a European bronze medal. She found herself standing on the podium shoulder to shoulder with some of the world's greatest skaters - Annie Lambrechts, Ingrid Van Marle, Paola Cristofori to name but a few. It was a proud moment for Kathy and the watching British contingent to cherish. The following year, the 1980 European Championships were to be held on home soil at Southampton, the venue where Kathy had been crowned British Champion two years earlier. The "old guard" of Chloe Ronaldson and Pat Eason had unceremoniously been asked to move over having now been dropped from the team in favour of younger blood, namely Lyn Coles, Denize Lipyeat, Susan Carter and Sharon Walton. The only remaining female skater from that era was Kathy Smith, now finding herself as the senior skater amongst the women's ranks. Kathy skated all five events but her highest placing of 18th in the 5000 metres showed that maybe it was time to have rethink on her international skating career. She had been in the team on and off for 13 years now and it was evident that she was now struggling to stay with the more junior skaters. The fact that Kathy was never to don a British jersey again came as no surprise, least of all to Kathy herself. For Kathy, though, her daughter Lesley was now enjoying some skating success of her own. 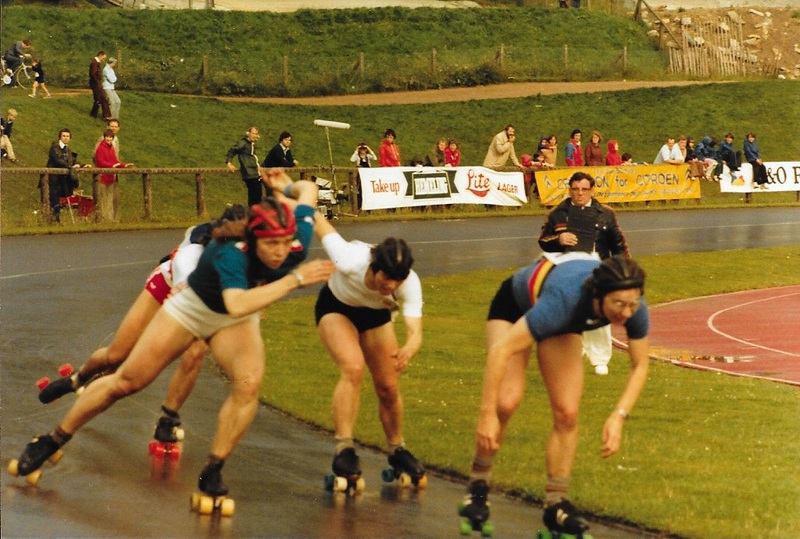 At 14 Lesley had been selected to represent Great Britain at the first ever Junior European Championships in Venice (track) and Finale Emilia (road), Italy in 1980 and again a year later in Pamplona, Spain in 1981. It was a proud moment for Kathy and to this day it remains the only time a mother and daughter have represented Great Britain at major international Championships. Kathy's competitiveness still did not abate, though. She continued to win medals at British Championships right up until 1993. In fact, there were very few years between 1980 and 1993 where she was not amongst the top three in one or more of the Championship events. The 1991 British Championships were a much discussed affair, however. Kathy had entered the events as normal, but as the Championships approached it soon became apparent that she was going to be the only entrant. 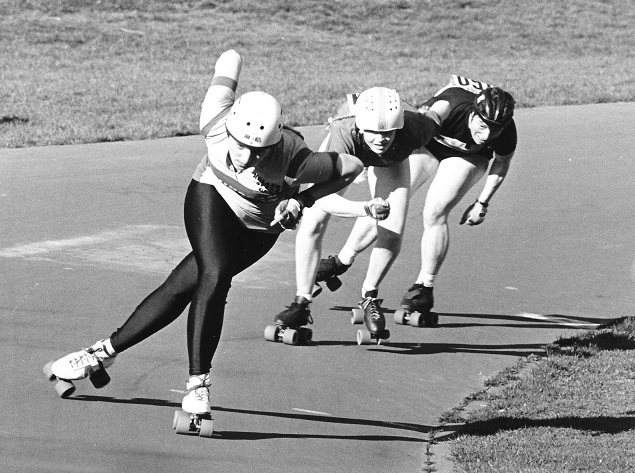 Kathy took to the track in each of the five events and skated as hard as she could. She was awarded all five titles, but for Kathy these default victories obviously could not compete with her 1978 victory. Since that time the British skating federation now posts times to achieve for gold, silver or bronze in the case where there is only one entrant. Shortly after winning her last senior medal in 1993 Kathy took a step away from the sport for a while but in 1996 came back with renewed vigour as Britain held it's very first Veterans Championships. Kathy entered and now aged 52 went on to win the 5000 metres and Half Marathon titles. By now traditional quad skates had given way to inlines and Kathy, being the stalwart competitor that she is, bought a pair and began to train on them. Despite struggling with the technique she persevered and continued to race on them with some success. Kathy's last victory came on 11th July 2004 in the Veteran Ladies 3000 Metre British Championship on Tatem Park, London, her 11th Veteran title to add to her six Senior titles. Shortly after this victory she hung up her skates and retired from competitive skating altogether. Kathy now lives in Milton Keynes with her husband George, to be closer to her family where she enjoys the company of grandchildren. A born racer and a great competitor who simply enjoyed the buzz and the thrill of the sport, Kathy got more personal satisfaction out of speed skating than most people ever think is possible to get. She will tell you that her fear of flying held her back from many international trips and that her one regret is never having skated a World Championships, but nobody can dictate circumstance. Kathy's competitive racing career spanned more than 40 years but always firmly putting her family before any skating competition. Not many of her rivals could lay claim to a record like that and very few had children of their own or continued to race once they did. And yet as well as being a full time mother Kathy still managed to be a British team member for 13 years, a multiple British Champion, a European bronze medallist and of course a British skating legend.